This first assignment in The Art of Photography (TAoP) is based on one of the most fundamental principles in design: contrasts. The assignment requires eight pairs of photographs to be produced demonstrating eight different sets of contrast. Additionally a photograph should be presented that displays contrast within a single image. In preparation for this task I, following the advice in the course notes, spent some time looking through my previously taken photographs searching for possible contrast pairings. This was a useful task in several regards. Firstly, it helped me question what factors made a subject represent the contrast concept, such as background, colour and commonly held ideas about the subject. Secondly, having identified some contrast pairs within my photo library it made the assignment seem less daunting. I also undertook some background reading (Freeman, 2007, Präkel, 2006) on how this assignment was developed in harmony with the philosophy and teachings of Johannes Ittens. Ittens taught at the Bauhaus, Germany and set his students the initial task of discovering and illustrating the different possibilities of contrast. Looking at other OCA TAoP student’s blogs was also helpful as it allowed me to see the different ways that contrasts were interpreted and presented. Several students also explained their thought processes and work planning. 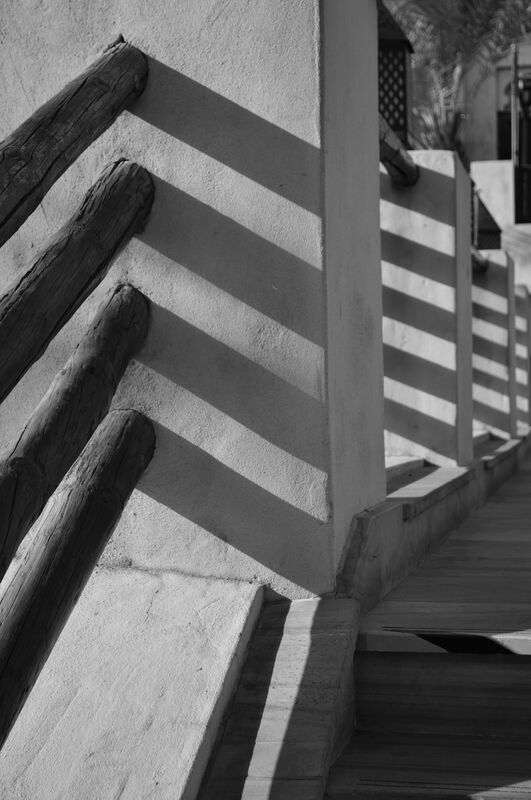 The above steps helped me to decide upon the contrasts on which I wanted to concentrate. I began to generate ideas for subject matter using mind-maps/spider diagrams to brainstorm. The subject ideas, then led me to consider design options. The following images were taken with a Nikon D5100 and 18-55mm lens. 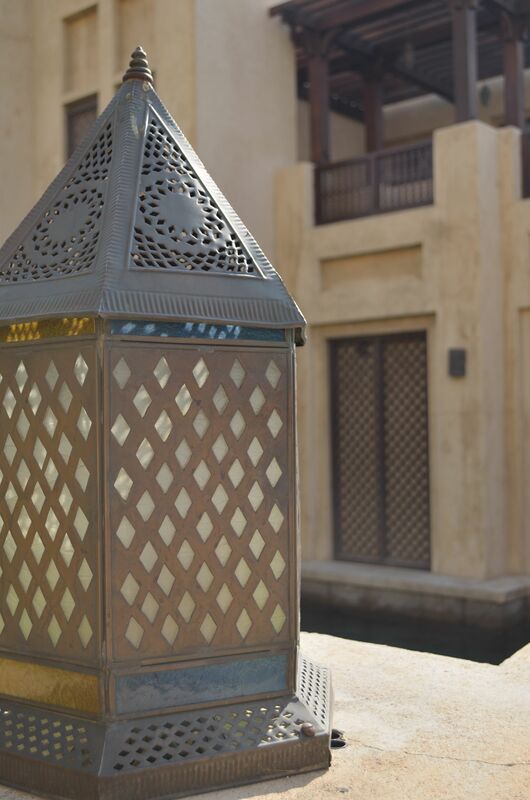 I spotted this Arabic style lantern at a local souk and though it demonstrated ‘pointed’ through the lantern top and the points of the diamonds. The photograph was taken on a very sunny afternoon and while I did like the effect of the sun shining through it, I found that I had to attempt several different camera positions in order to avoid lens flare. I used an aperture of F/5 to blur the background slightly but still ensure it was still clear enough to place the lantern in context. This photograph was taken on the same afternoon and at the same souk as ‘pointed’. 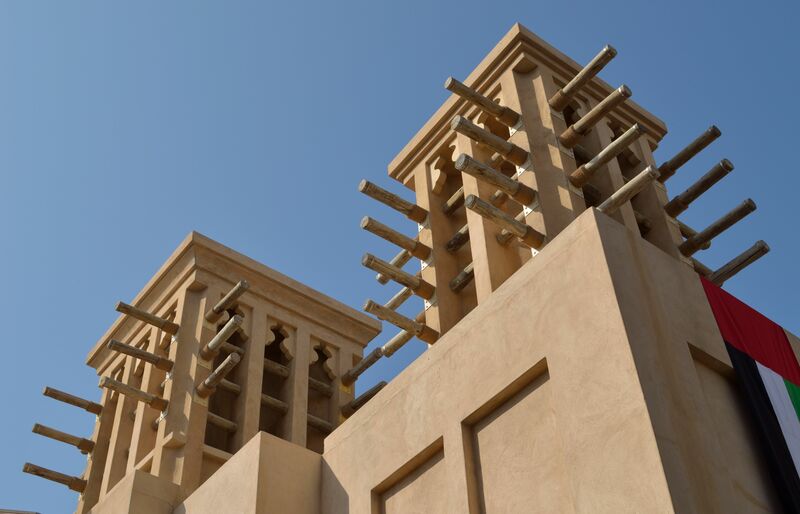 The wind tower is a traditional architectural element in the Arabian Gulf using wooden joists. I knew from early on in my planning these features would somehow appear in my ‘blunt’ photograph. I took this photograph with my lens set at 30mm from the base of the tower. This has helped create diagonal lines, which lead the viewer up the tower to the ‘blunt’ features. I had several ideas for ‘hard’, but quickly found that they were either cliché or rather boring. I literally spent 20 minutes staring at a wall of bricks through the viewfinder trying to make it interesting, to no avail. My idea for ‘hard’ eventually came about after noticing a local shop stocked Werther’s Originals, a hard sweet on which I broke a tooth when I was younger. This inspired me to use a selection of hard sweets and lollipops, more colourful than a Werthers Original, to demonstrate ‘hard’. I attempted several arrangements but found, as Freeman (2007) notes can happen, that this was difficult and my results seemed forced and not particularly exciting. I decided to create an image where sweets filled the frame. I arranged these on a tabletop and shot the photograph from a low perspective with a 45mm lens and a large aperture of F/5.3. 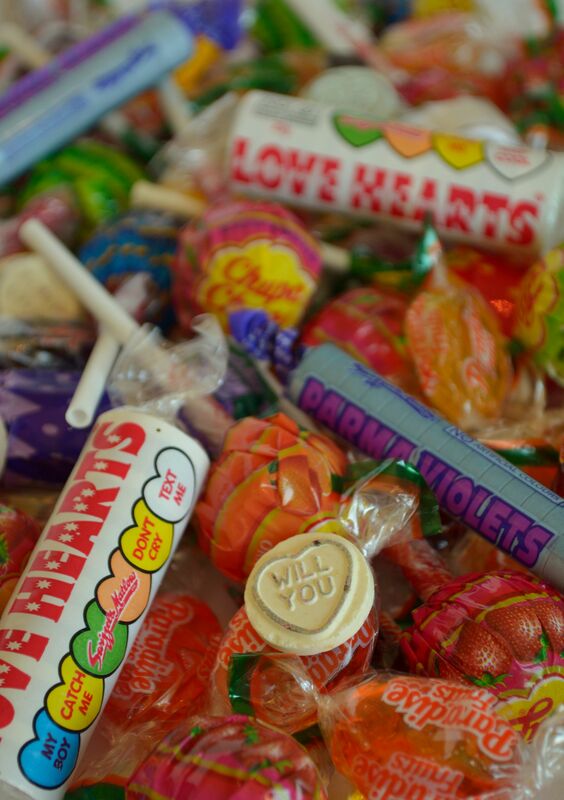 The low depth of field and selective focus point, just below centre, gives the impression the ‘hard’ sweets extend way beyond the four edges of the frame. 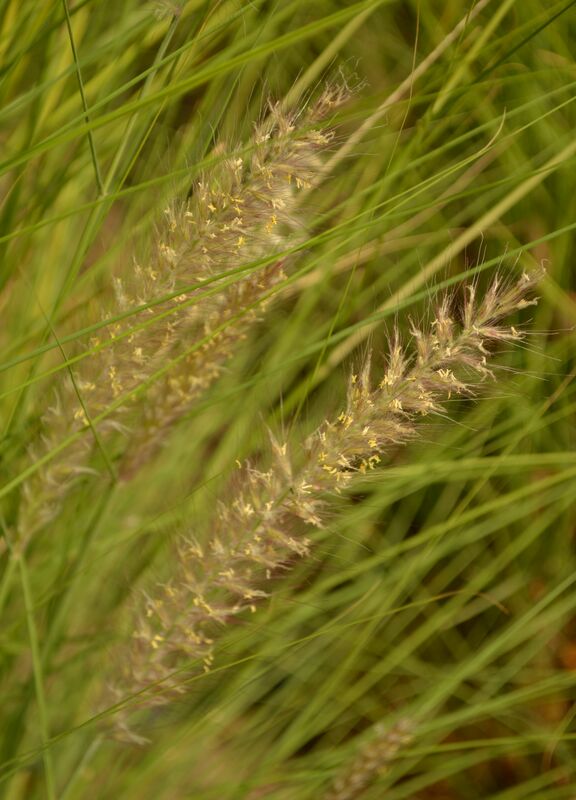 For ‘soft’ I decided to photograph these grasses, which grow behind my home. To illustrate soft I wanted to capture the grasses as still as possible in order to produce a clear image. After attempts on several days I managed to get a still morning. I set my lens to 52mm and attempted to get as close as possible to the grasses. I used an aperture of F/5.6 to create low depth of field to make the background blades of grass less distracting. These dishes are, unquestionably, ‘rounded’. 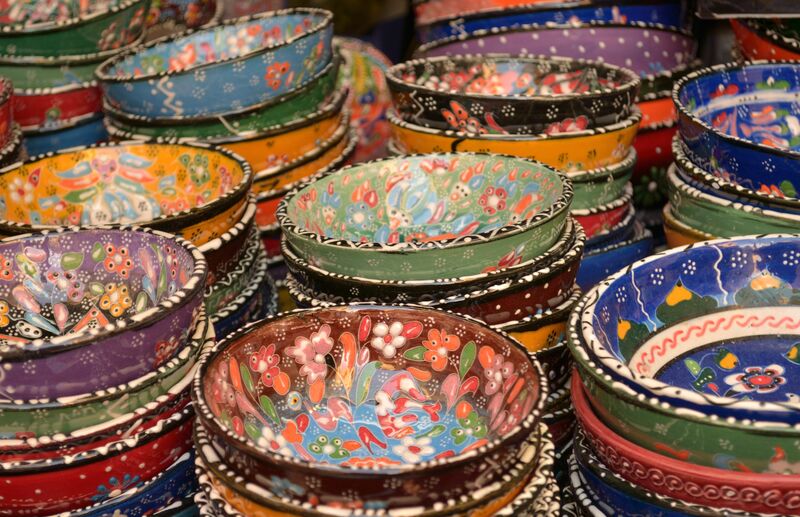 Their shape, decorative designs and colours caught my eye as I walked through a market. I tried to select an angle that would show the roundness and also show that there are numerous dishes stacked into towers. I selected these kayaks to represent smooth but struggled with an interesting angle to captures them. I decided to really close in on them and frame them tightly to show the smooth texture of their surface. 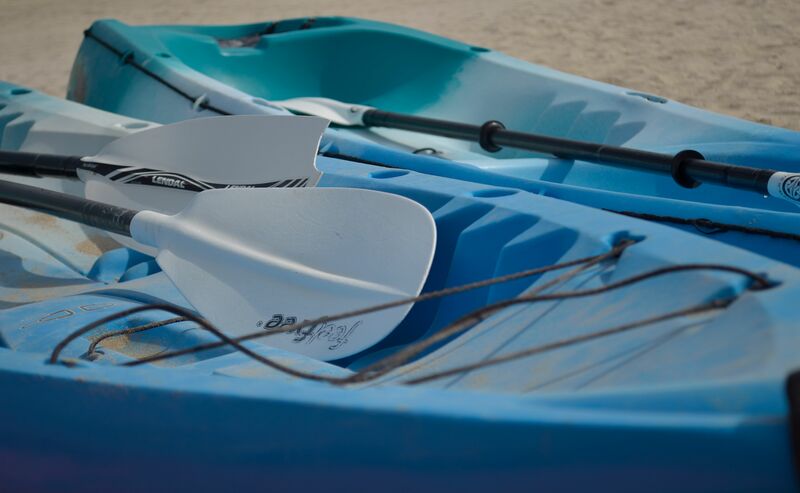 I focused on the paddle to differentiate between its glossy smooth finish and the matt smoothness of the kayaks. I decided early in my planning that the trunk of date palm would be my focus for rough. 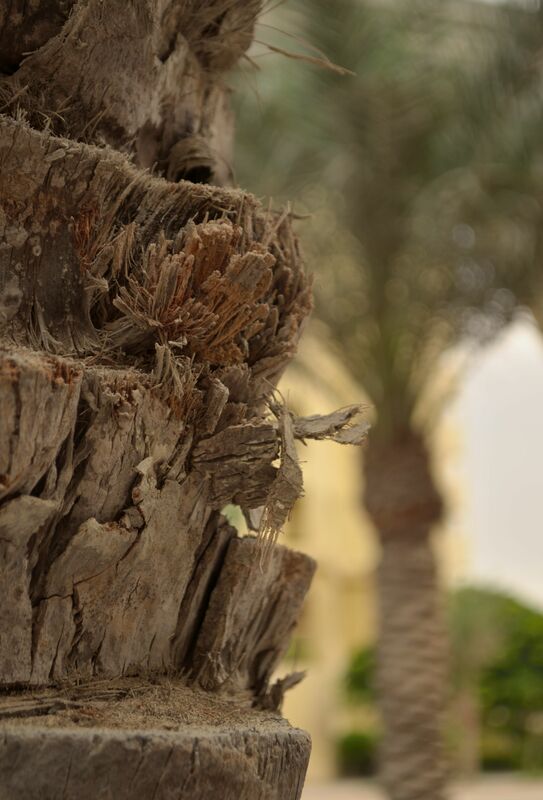 I planned and sketched draft images which placed focus on the rough texture of the bark while in the distance there would be a palm tree, or trees, to inform the viewer as to what they were looking at. However, as I began the task I found many of the trees’ bark appeared almost smooth whilst others had very distracting backgrounds. I shot the tree bark from close range with my lens at 50mm while the F/5.6 aperture allowed the tree in the background to be out-of-focus but still be identifiable by its form and colours. Although a carousel horse may be a subject that is typically thought of as moving, I selected it to illustrate ‘still’. I did this as at the time of day when I frequently pass the carousel, there is never anyone riding it. I chose the vertical frame as it virtually isolated the horse from the others on the ride and showed the middle section of the carousel to add context. I recently read a message by @photoworks_uk on Twitter which linked to the website of Kevin Cooley, www.kevincooley.net. When looking at Cooley’s portfolio, I found his use of slow shutter speeds to capture light trails in the Nachtfluge and Light’s Edge series to be quite beautiful. 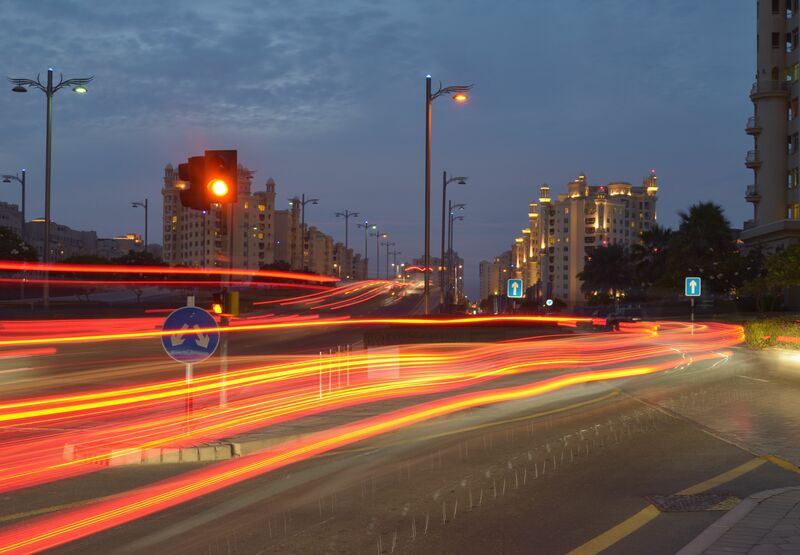 This inspired me to attempt to capture light trails to illustrate ‘moving’, albeit in a far simpler scale. I chose a safe position where the road divided into different directions and looked towards an elevated stretch of road. As it tends to get dark very quickly here I set my camera on a tripod prior to sunset and waited for the sun to set and the cars’ lights to switch on. With the camera in Manual mode I experimented with different shutter speeds, eventually taking this shot at F/11 and a 6s shutter speed. I took many shots after this one when the sky was much darker. However, as it got darker the street lights got brighter which I felt was distracted from the light trails. Living in Dubai, it was tempting to opt for a photograph of the Burj Khalifa for this contrast. 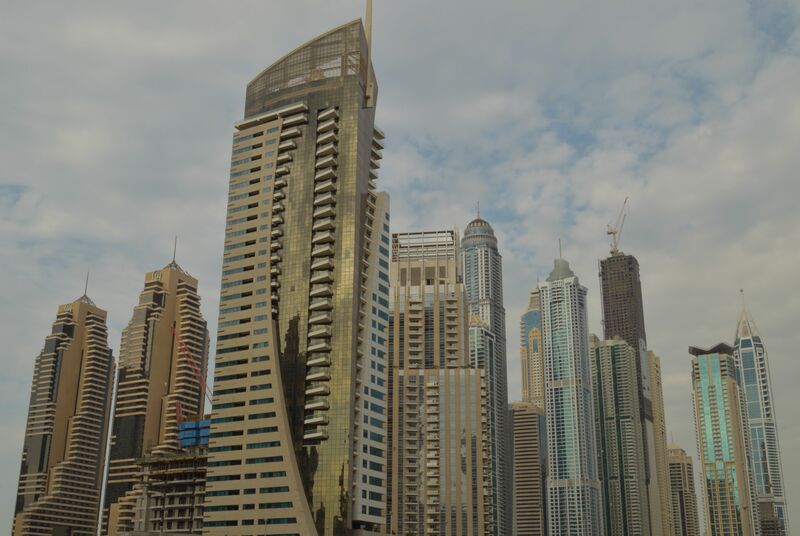 However, I resisted and instead opted for a lesser-known cluster of high-rise buildings around Dubai Marina. As I wanted to retain as much detail as possible I opted for a small aperture of F/20. On the day the photograph was taken the sky was unusually cloudy and this seems to have given the image an almost surreal quality. This photograph of the mid-afternoon sun shining through the doorway wasn’t planned and when I initially took it I considered it for ‘rounded’ or ‘curved’. However, when I got home and looked at it properly on the computer screen I realised how fitting it was for ‘low’. 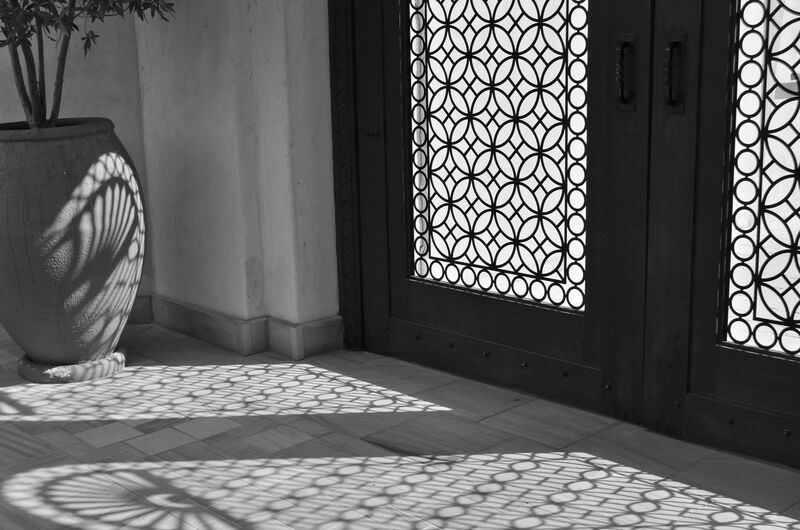 I converted it to monochrome as I felt this emphasized the shadows cast by the door grille across the floor tiles and planter. It also highlights the rough texture of the planter and wall. I found it quite difficult to choose, what I would consider, an interesting subject for straight. 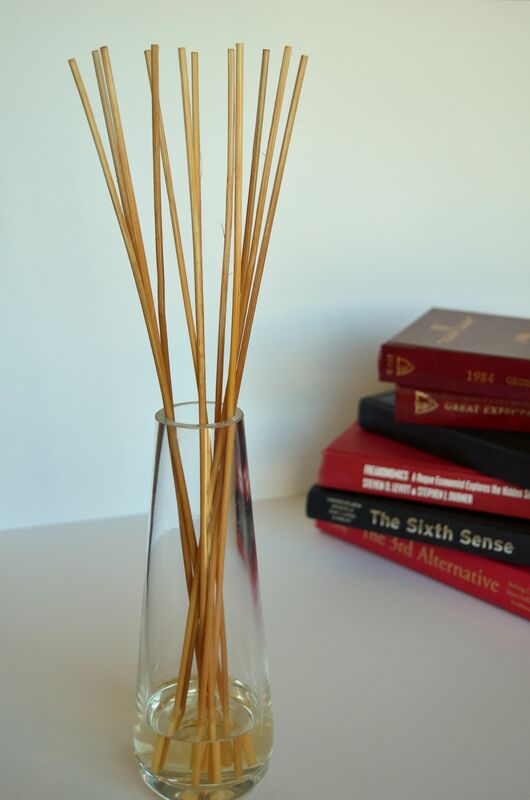 I eventually decided to use a bamboo reed diffuser I had at home. I arranged it on a table covered with white card. I placed some books behind and to the right of the reeds to try to add balance and interest to the composition. After experimenting with the light at different times of the day I took this photograph mid-morning to avoid hard shadows. I used a large aperture and selective focusing to emphasise the ‘straightness’ of the bamboo. 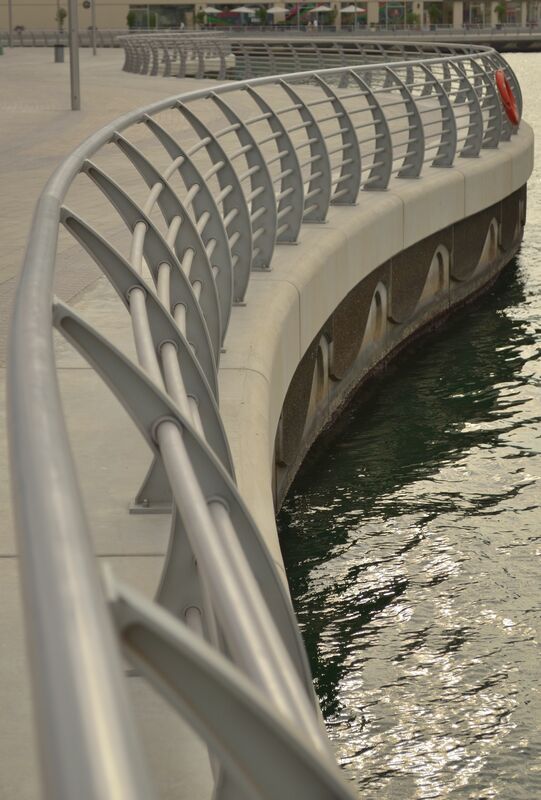 I shot this curved railing from several points to find one that would best show curved. I also experimented with different focal points, eventually deciding upon a central point, ensuring sharp focus as the railing begins to curve. I wanted to use a large aperture to depict ‘many’ with an out-of-focus background to add a sense of depth and continuation. 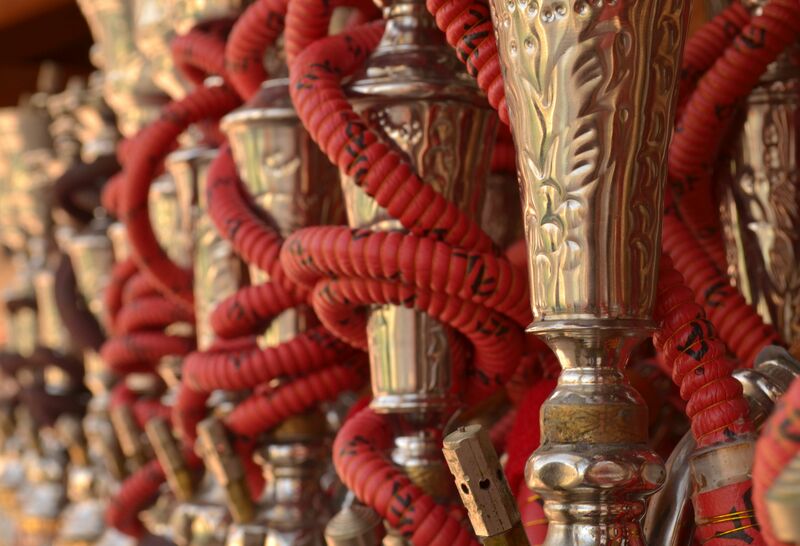 I selected this row of shisha pipes with the focus being on the detail in the first pipe. 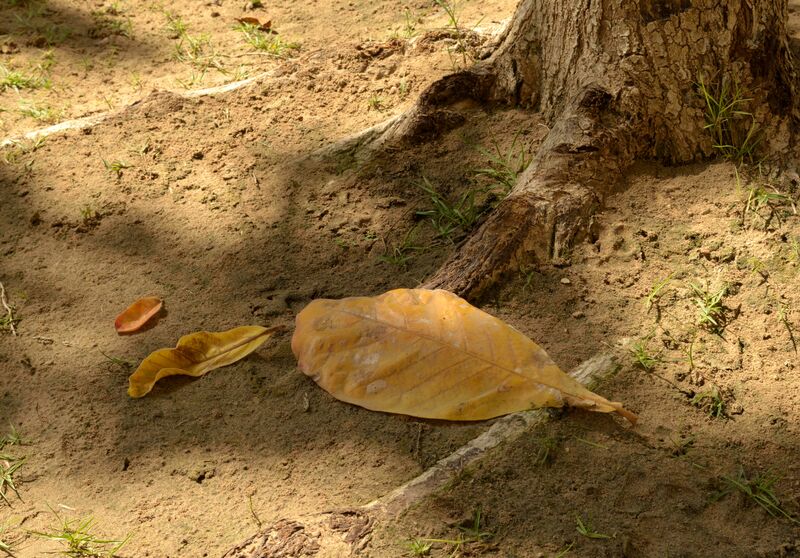 For the ‘few’ contrast I arranged three leaves around a tree base. My original plan was to set up an arrangement that divided the frame according to the golden ratio. I did this by eye and seemed to have judged it quite well with the position of the tree across the top of the frame. However, I could have placed the large leaf lower to create a better intersection point. Hopefully, as Freeman (2007) suggests, dividing the frame by eye will become more intuitive over time. I chose this location and subject because of the different textures and the contrast offered by the mix of light and shadow in the frame. 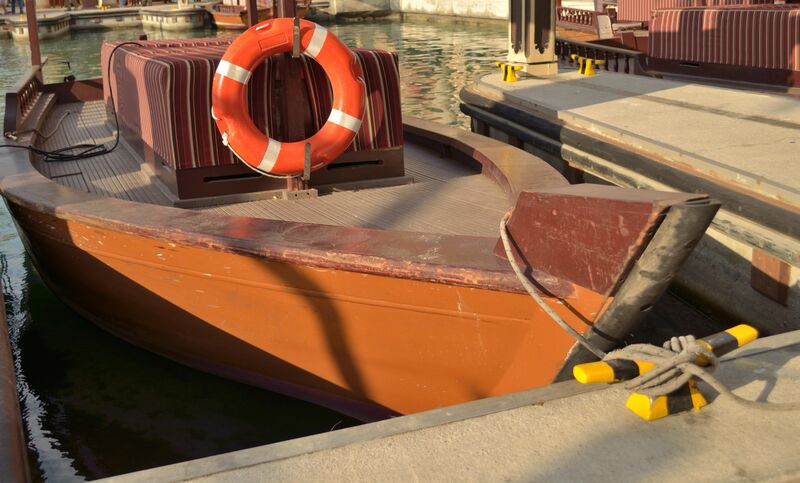 I selected this photograph of an abra, a water taxi, to represent the contrasts diagonal and rounded ‘in one picture’. I took the photograph from a close position with the lens at 26mm focal length. This has helped to make the diagonal lines in the sides and front of the abra, and in the berthing space, more prominent. The safety floatation ring is the obvious ‘rounded’ contrast. This assignment has really helped me to look at potential photographic subjects with new eyes. Previously I was looking for subjects as a whole, however this has helped me look more closely at individual elements such as colour, texture, shape and position and consider what messages they contain. At the beginning on this task I had very few ideas about what subject matter to photograph, but I found out very quickly that many of the photographs could be used to illustrate more than one contrast. 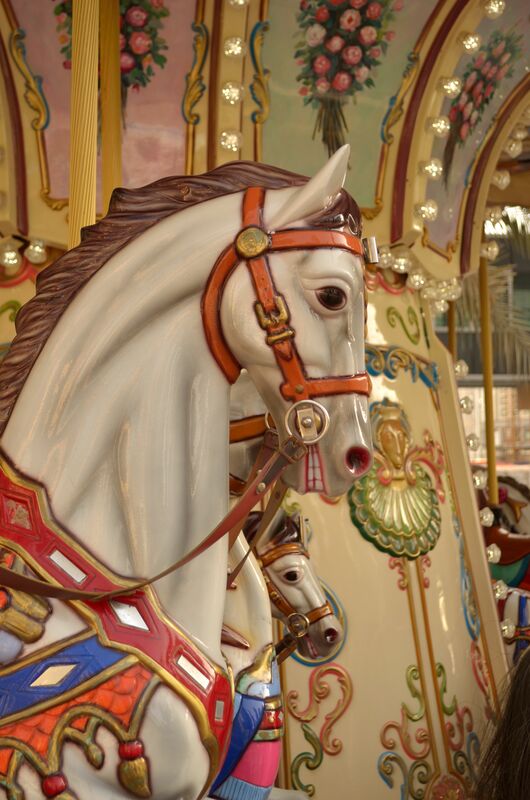 The carousel horse, for example could be described as still, moving, smooth or hard. This entry was posted in Assignment One-Contrasts on December 5, 2012 by catherinefinniganphotography.